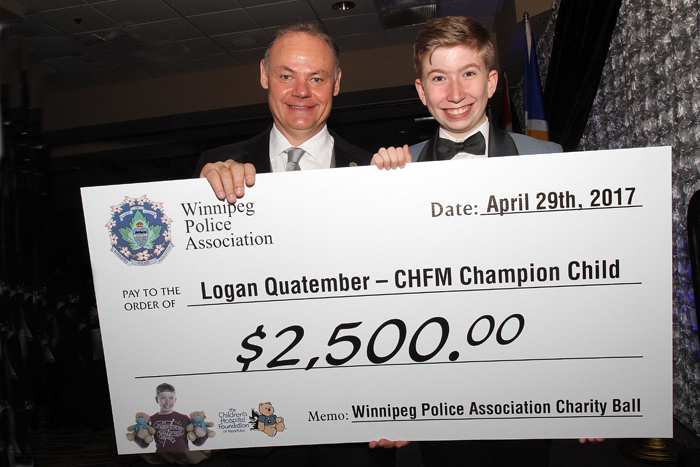 Saturday, April 29, 2017, Canad Inn Polo Park: Thank you table sponsors, raffle prize sponsors, donors, special guest speakers, 2017 Champion Child Logan Quatember, Emcee Ace Burpee, Winnipeg Police Pipe Band, Danny Kramer Event Band, and all volunteers for making the 93rd Annual Winnipeg Police Association Charity Ball in support of the Children’s Hospital Foundation of Manitoba the most successful WPA Charity Ball ever. Generous raffle prize sponsors including Air Canada, Home & Garden RONA, S & J Construction, Danny’s BBQ & Smokehouse, City Cats, D & J’s Excellent Adventures, River Park Dental Centre, Bayview Construction, Molson Coors, Morden’s of Winnipeg, WOW Hospitality, Sarte Heating & Cooling, and Canad Inns greatly assisted in helping to set a new record for funds raised from the event. All proceeds to the Children’s Hospital Foundation of Manitoba. The official amount of funds generated for the Children’s Hospital Foundation of Manitoba will be announced at a later date, however, will bring the 26-year Charity Ball fundraising total to nearly $600,000. We will see you all again April 28, 2018! There was one raffle prize package and the 50/50 unclaimed from the 2018 WPA 94th Annual Charity Ball. Raffle ticket WPA 0142 (prize #6) is the unclaimed raffle prize and 50/50 ticket 0622 is the winning 50/50 ticket. Please contact the WPA office at (204) 957-1579 to collect your prize. Prizes will be held till 3:30 pm, Monday, May 14, 2018.